This week’s round of the women’s KISS Super League started out steady but exploded on the final volcano climb. Just under 41 kilometers, this route is mostly flat but finishes on top of a hill. Racers face two laps of Watopia’s Volcano Flat route and one lap of the Volcano Climb route. The volcano climb is 3.7 kilometers at an average 3.2% grade. That includes a flat section in the middle, so the climb is steeper than it seems. The first part of the race was relatively calm. Nobody was left behind during the hard start out of the gate. For several kilometers, the racers settled in and waited for the right time to strike. Eventually, Whitney Allison (Hagens Berman Supermint) struck on the zig-zag shaped road leading to the Watopia village. But Erica Clevenger (Sho-Air Twenty20) led the peloton to chase her down, using an aero helmet PowerUp for a speed boost. Lizzy Banks (Bigla Cervelo Pro Cycling) tried a few times to break away. On her third attack, with about 10 kilometers to go, she used an aero helmet PowerUp to gain several seconds on the group. The riders in the peloton hesitated for a few minutes, knowing that a lone attack was unlikely to stick, but Banks was holding her gap. Finally, Clevenger took to the front of the bunch and raised her power to bring Banks back. She and her team were determined to keep the group together. These surges dropped a few riders, but most were able to hang on. Now, 22 racers approached the volcano climb together. 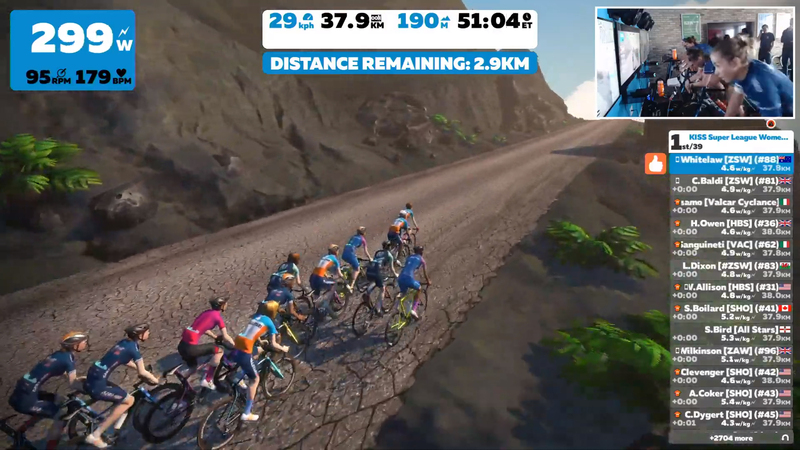 Vicki Whitelaw (Zwift All Stars) charged to the front of the bunch. She set a brutal pace at the base of the climb, putting several riders in trouble as they tried to follow. The peloton stretched and snapped apart. By the time they entered the flatter section halfway up, the front group was cut in half. 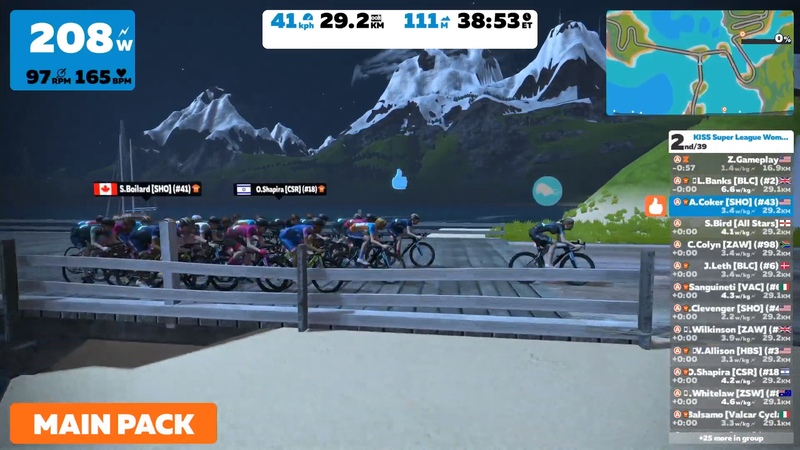 Sho-Air Twenty-20 and Zwift All Stars both had all four of their riders. 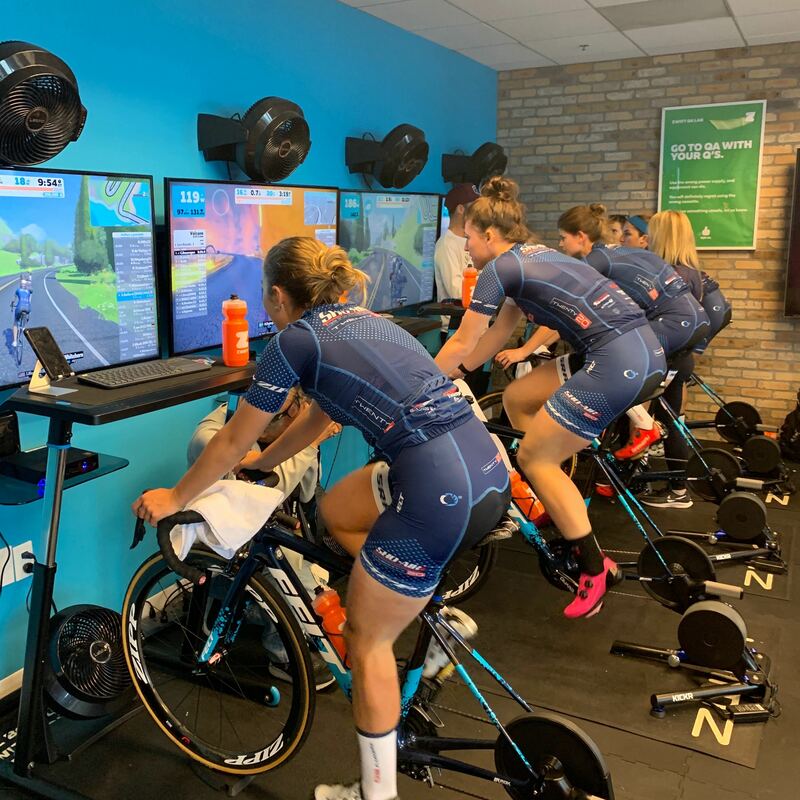 Valcar-Cylance and Hagens Berman – Spearmint each had two, and Mary Wilkinson was the only one remaining from the Zwift Academy Dream Team. When the road kicked up again, Ilaria Sanguineti (Valcar-Cylance) took over as pace-setter. 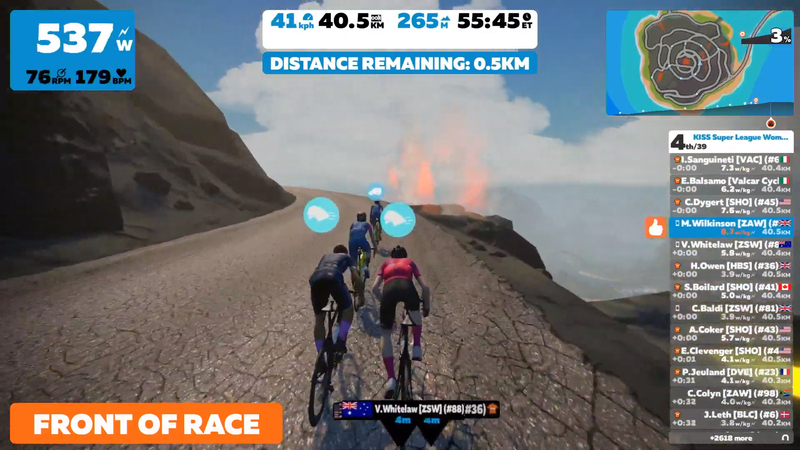 The climb got faster, and soon Sharon Bird (Zwift All Stars) lost contact. With 600 meters to go, Sanguineti shot off the front of the group. She hit a draft truck PowerUp, but with no slipstream to follow, it wasn’t any help. Elisa Balsamo (Valcar-Cylance) took off in pursuit. 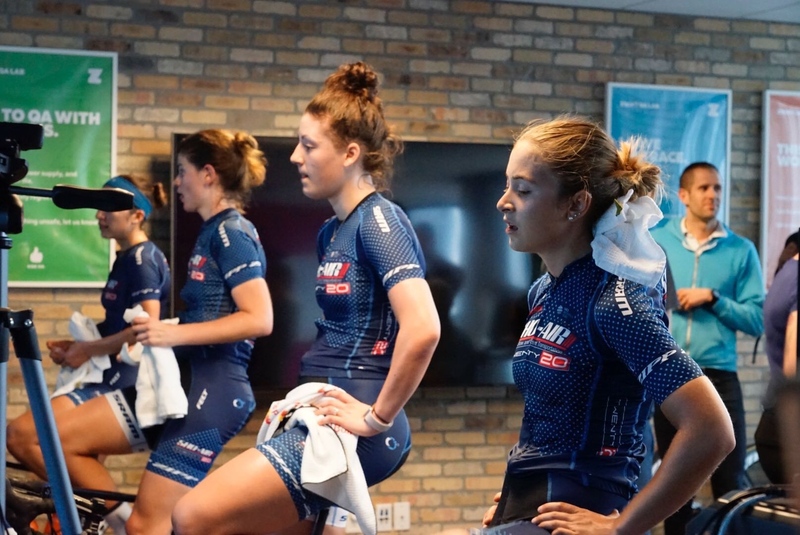 Wilkinson, Chloé Dygert Owen (Sho-Air Twenty20), and Harriet Owen (Hagens Berman – Supermint) started sprinting with aero helmet PowerUps. Wilkinson took the lead and opened a gap on the others. She had 200 meters to go, then 100, with a clear view of the finish. But Harriet Owen found one last kick in power and came around right at the line! She grabbed the first win for Hagens Berman – Supermint in the KISS Super League. Owen said she’s happy with her win and pleased with how the race went. She said it was a little calmer than the previous weeks of the league. She said she didn’t think she could catch Wilkinson, but she had to try. With a few weeks of Zwift racing under her belt, Owen said she’s getting the hang of it now. Hagens Berman – Supermint are now fourth in the team standings. 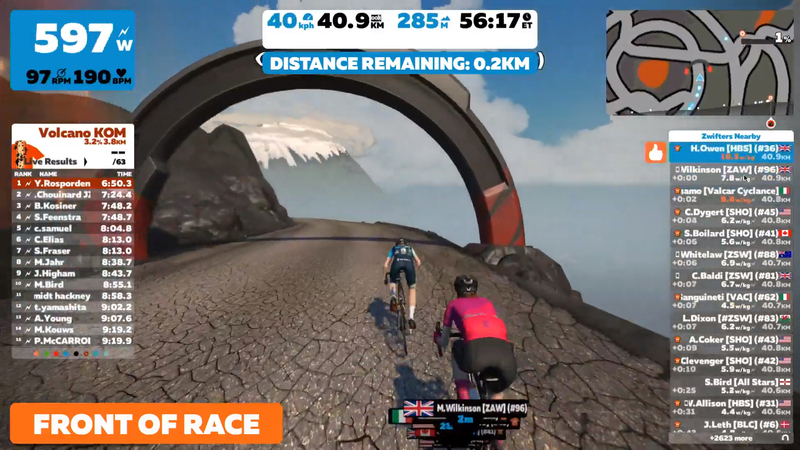 The Zwift All Stars and Sho-Air Twenty20 both had strong showings this week, with four riders each in the top 11. Tune in live! Please note: Race times have changed in the U.S. due to Daylight Saving Time.